The hula dancers come and go but some things stay the same. I recognize many of the same musicians and, most of all, the torch-bearer and the corresponding conch shell blower. 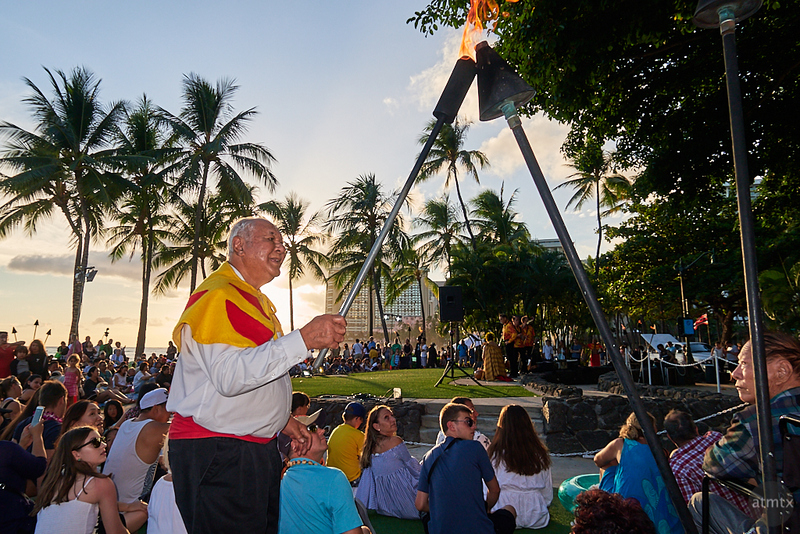 The torch lighting and conch shell blowing always happens in the beginning, kicking off the show. As a consequence of casually standing along the side of the audience, I happened upon a perfect positioning for the torch-bearer. I quickly turned on the flash and took this shot with the Canon G7X Mark II. The flash is actually a key point and makes this image possible. As much as I love my twin Olympus cameras, the OM-D E-M5 Mark II and PEN-F, they don’t have a built-in flash. Like many of the more serious cameras, they either include a separate small flash or none at all. I find these separate units inconvenient and I never have one, when I need it. It’s true that a on-camera flash is considered an entry-level item and I rarely need one. But, here’s the perfect instance when a little fill light works perfectly. Upping the exposure compensation gives a totally different look. Instead, I want to pop some light in the foreground to balance out the bright sunset sky. The Canon G7X Mark II did an admirable job.